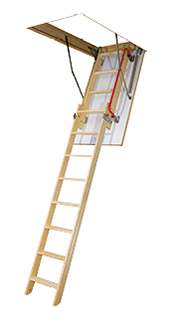 The LWK Komfort loft ladder features all advantages of a new design, additionally equipped with aesthetically finished insulated white hatch,handrail and stile ends. 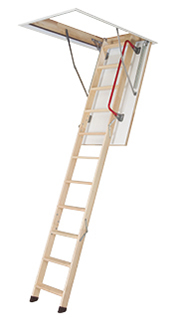 The LWZ Plus is a 3-section folding wooden ladder with an insulated hatch. The wooden ladder box includes a steel frame, finishing linings slats and a quick installation system. 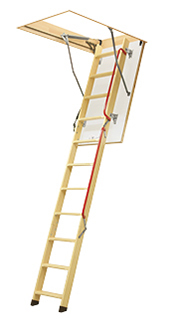 This simplifies installation and reduces the time to fit the ladder in the ceiling. perfect for installations which are subject to stipulations as specified in building regulations. special supporting mechanism for folding and unfolding the ladder. 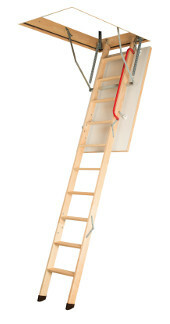 The LDK loft ladder is a double-section loft ladder with a slidable lower section. 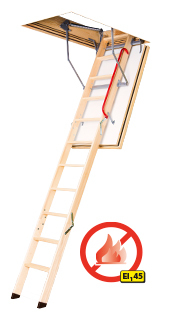 This makes it possible to eliminate the swing space required on the landing for unfolding the ladder.